The Chillingham herd are still White Park cattle,they are just not domesticated. Cars in the driveway so I pulled in at the house next to the pasture with British White cattle. Not their cattle, but they know the woman who owns them. And they are British White, not American British White. Owner is English. She's not satisfied with AI breeding. Has her own bull / herd sire. Left a link to this thread on Downsizer. Also left my name and e-mail. Looking forward to speaking with her. Just another interesting day in the great Garden State of New Jersey. Yesterday I spoke with the woman who owns the British White cattle. We had a very nice chat, and I have been invited to come see the two new calves. She sent me pictures and they are so sweet! Gregotyn, guess what? Back in the late 1970s she was a veterinarian - in Wales! Whereabouts in Wales, was the cattle lady-north or south-I am in mid-east Wales, near England-6 crow flying miles. We spent a couple of hours walking among the cattle in two different pastures. Francis, the herd bull, is so calm that we could go into the pasture with him, some cows, and two new calves. There was some forefoot scuffling when we first came in, but he doesn't know me. And yes, he has scurs. Gregotyn, herd owner went to veterinary school in Bristol, and told me she lived in south Wales. Ty Gwyn, scurs are not horns. Horns are attached to the skull. Scurs are not. You can gently tug on a scur and it wobbles a bit. 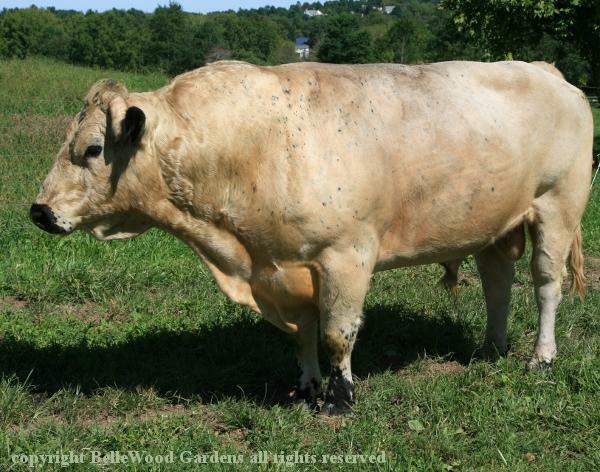 British White are polled cattle. Poll is dominant to horned. So cattle with Pp genetics are polled / no horns. But even PP can have scurs because it is a different gene. "Scurs are small horn-like structures that, in young cattle, are usually not attached to the skull. They often look like small horn buds, and can vary in shape and length. In older cattle, they can sometimes attach to the skull like a horn. Having scurs is a separate trait to being polled or having horns." "To emphasize the difference between scurs and horns, cattle should be classified as smooth-polled, scurred-polled or horned. Remember that all smooth-polled and scurred polled cattle have at least one gene for the polled condition. However, horned cattle can never carry a polled gene." Yes I know British White are polled,that`s why I asked the question on seeing the horn/scur,i have seen that in cattle that have not been de-horned properly ,young cattle were the buds as you say wobble and in older cattle were the horn structure has grown and become securely attached. But have bred cattle for most of my life,and at one time had polled cattle as sucklers Angus x Friesian/polled cross horned,and them crossed with horned still produced polled and their daughters again crossed with horned still produced polled,so I remain sceptical until I read up on this occurrence. The genetics go like this, Ty Gwyn. Horned cattle must only have pp genes. Without genetic testing you don't know if your polled cattle - cows and bulls - are PP or Pp. And Pp X Pp can produce horned offspring. Understand that statistics being what they are odds are, well, odd. The coin is flipped anew each time. Genetics also hold colour genes so picking the right colour Sire can raise the percentage of obtaining the preferred colour off spring,this is in Horse`s. Looking at them percentages of No horns against horns,what stands out is where the British White derived from. Over in the US they have American White`s which complicates the situation again. Appreciate your comment, Ty Gwyn. I made the change, will see if Diane has any comment or correction. Did you notice what was said about the head in the breed standards?